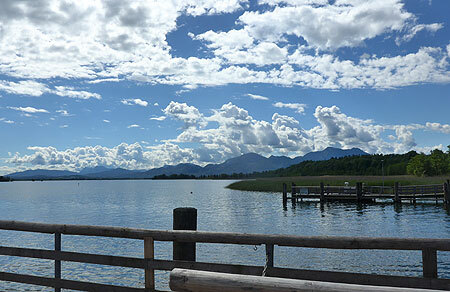 The largest lake in Bavaria is the Chiemsee, which is otherwise known as the "Bavarian Sea". Among its many attractions are the island of Herrenchiemsee with its palaces, the monastery on Frauenchiemsee and Julius Exter's House in Feldwies. The Chiemsee is under the protection of the international Ramsar Convention, which was founded to preserve ecologically important wetlands. Since 1954 the mudflats in the delta formed where the Tiroler Ache flows into the lake have been a protected retreat for many endangered species of waterfowl and wader. The Chiemsee is approximately 90 km southeast of Munich and can be reached via the A8 from Munich to Salzburg (exit Bernau). There are paths round the lake and the Herreninsel. Chiemseebahn (in summer) or bus (in winter) to the landing stage "Prien/Stock"